I can’t remember the last time I was lucky enough to score a game at our Goodwill that was released in the current year. Usually games sit on shelves for a while before they end up in the donation pile. 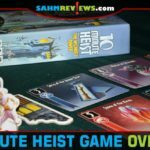 This week’s Thrift Treasure not only came out in 2015, it was only released in the February edition of Loot Crate, a monthly subscription box service. SuperFight (The Loot Crate Deck) had already been discarded and was mine for only 88 cents. 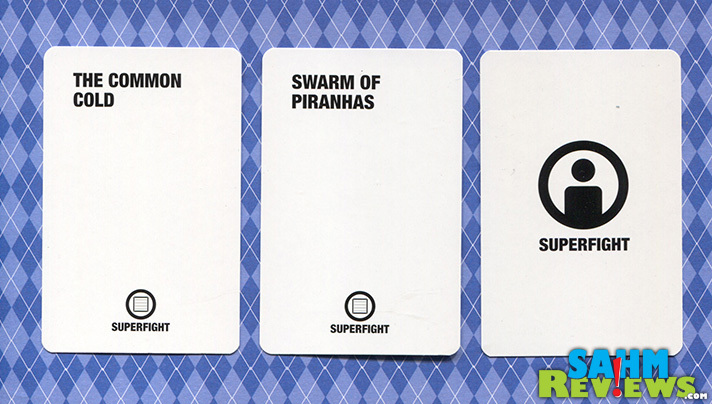 SuperFight isn’t brand new to the game world, but was a newcomer just a year or two ago. 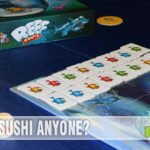 Following the popularity of games like Cards Against Humanity and other deck-based games, it has already enjoyed a number of expansions and now this Loot Crate exclusive. 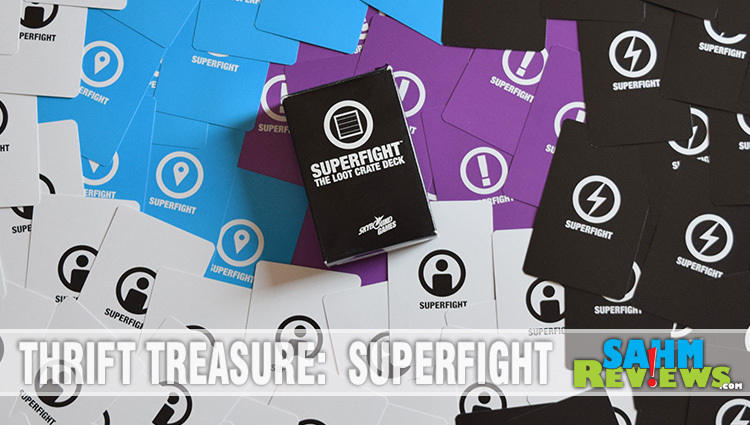 But what is SuperFight? 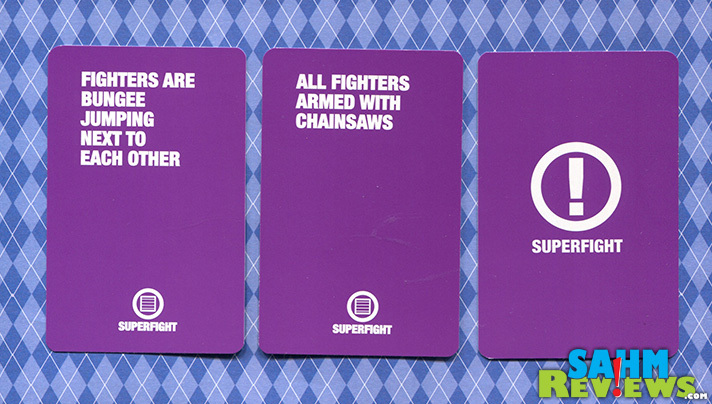 I guess you could best describe SuperFight as a game of war. Each player draws three white cards from the deck and chooses their warrior. Your opponent does the same. You may end up with something you’re truly afraid of, like a swarm of piranhas, or something not so fearsome like the common cold. But what is a fighter without a weapon? Same deal, draw three black cards and choose one for your avatar. Now our piranhas have lightsabers! Both parties reveal their cards at the same time and argue over who should win and why. The rest of the table decides the victor with the winning fighter receiving a point (much like one of our party favorites, Snake Oil). Cards pass to the next player(s) until a pre-determined number of rounds are completed. Highest score wins. Even better, both sides are jumping on bungees next to each other, we assume tied to Godzilla’s uvula (does he have one?!). You can choose to use either the blue or purple cards, or both! 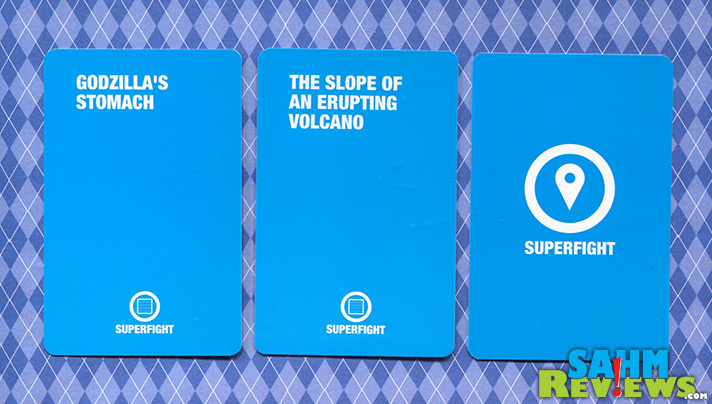 This 100-card set was a great introduction to the wonderful world of SuperFight. The original set contains 500 cards and is available on Amazon and directly via their website (most cost-effective). Be sure to check out all of their expansions and follow them on Twitter and Facebook to learn more about their upcoming releases! You always find some great games at your Thrift store. I guess I need to check ours out more often. I don’t know if I have ever seen games at our Goodwill.. but then I guess I have only been in there a couple of times. That is a great score to find one that’s current. My son got two Simon Swipes for gifts and we donated a brand new one. I’m hoping whomever got it was as happy about it as you always seem to be with your finds! I always like to read about what you’re playing. We’re a big game family too. That looks like a fun game. I bet my boys would enjoy playing this game. 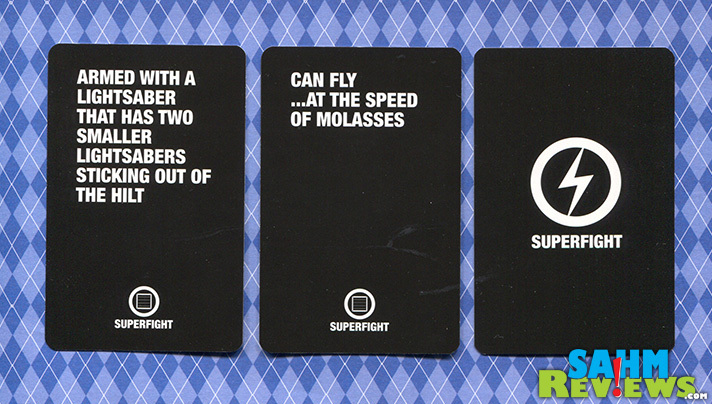 I enjoyed your review on SuperFight. I like card games, and play with acquaintances as we get together. I am not too interested in this one because it would probably result in loud voices, and disagreements among the people playing. In other words, this is a game not meant to be taken seriously. I love thrift store treasures. We always find the coolest games there (and so do you). I love finding treasures at the thrift store! I try to go every week! You always find the coolest games. This sounds like a lot of fun. You find the best games. My kids are always asking me to be able to find them. The Goodwill and discount stores are my favorite stores to show. I have to admit you are lucky when it comes to finding the good games. 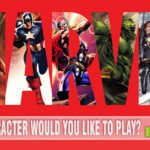 It is sad our youth today don’t like board games as much as video games but we do get them to play them anyway. Thanks for sharing. 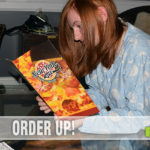 Ive seen a play through for this once – like a toned down Cards Against Humanity, but just as funny! Looks awesome! I can’t believe you found this at Goodwill! So Jealous. I couldn’t either! I had heard about the game, but it wasn’t for sale locally. Finding it at Goodwill was a score! While I haven’t personally played this game, I’ve watched a few people play it and it can be quite hilarious!